The Link G4+ AltezzaLink TALT+ PlugIn fits the Toyota Altezza 3SGE. 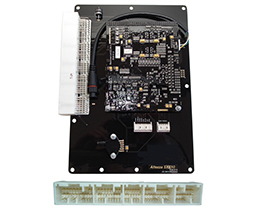 The ECU PCB fits discretely inside the original factory enclosure. Installation of Link's Toyota Altezza TALT+ ECU is a breeze - no alteration of the factory wiring loom is required. A built-in connector (or pins in some models) provides additional inputs and outputs such as oil pressure inputs or anti-lag / logging switches. Can be used on other vehicles with the 3SGTE "Beams Engine".